All those laughs have definitely paid off. 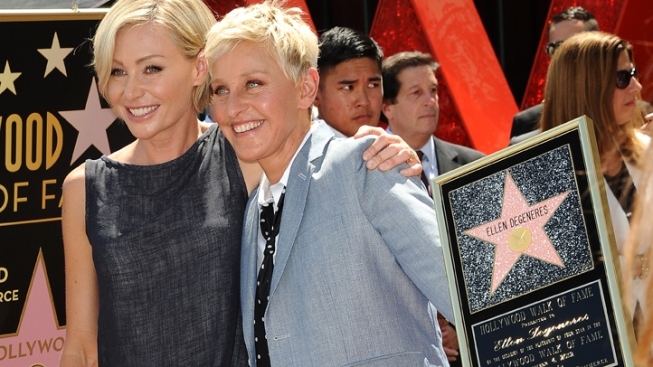 Fans--including Ryan Seacrest and Jimmy Kimmel--cheered as funnywoman Ellen DeGeneres was honored with the 2,477th star on the Hollywood Walk of Fame today. "I'm getting a star on the Hollywood Walk of Fame today at 11am," she tweeted. "Come watch me! Also, I'd love a ride home. 6270 Hollywood Blvd." Remember who spoke on behalf of Slash when he got his star? Once she arrived, Ellen was more than thrilled to see the crowd of people who wanted to experience this moment with her. She tweeted, "So excited to see fans here at the W Hollywood to see me get my star on the Walk of Fame! Come down if you can!" During her speech, DeGeneres did what she does best--crack jokes. "It is amazing. I spent my entire career trying to conduct myself in a certain way making sure no one walks all over me only to get to a point where people are going to walk all over me. It means so much to me that everyone showed up." Take a look at these other celebs that have a star!